The DASIE is a hollow cylinder made of various layers of laminated polyurethane foam rubber with rectangular reinforcement blocks in the ends. 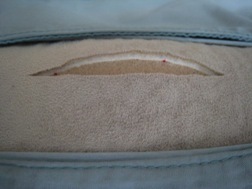 The multiple layers of the outer shell are designed to be cut, handled and sutured individually, much like the skin, subcutaneous tissue and the various layers of the abdominal wall. 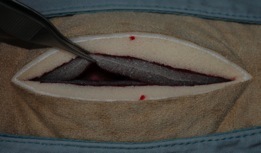 Red strings are incorporated within the subcutaneous layer to simulate blood vessels that are transected by an incision. These mock vessels can be grasped with hemostatic forceps and ligated. 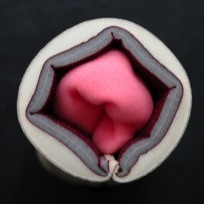 A length of hollow polyurethane foam ‘intestine’ is contained within each model's lumen. 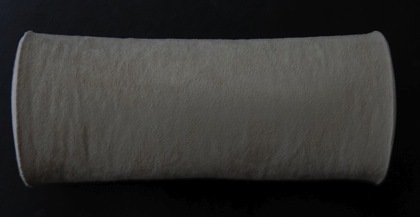 This intestinal tube can be incised, transected, sutured, or anastomosed to model urogenital or gastrointestinal surgery. 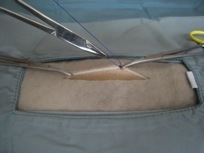 The DASIE can be used on all it’s surface allowing for multiple incisions and practice sessions. 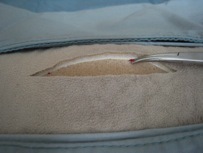 The DASIE is to be used for the sole purpose of practicing suturing skills. 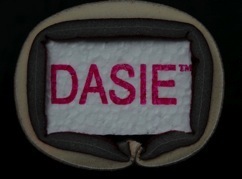 The DASIE should only be used by trained and licensed medical professionals such as veterinarians, doctors, and nurses, or veterinary, medical and nursing students under proper supervision and instruction. Proper care and attention should be exercised at all times the DASIE is in use or handled. DASIE Surgical Training Tools is not responsible for any injury, harm or damage from the use or misuse of a DASIE purchased from us. DASIE is not intended nor implied to be a substitute for proper medical training. Children or animals should not be permitted to handle, use, touch or play with the DASIE.